The number of Killearn Acres home sales that occur under duress is on the rise. Back in April, we reported that Killearn Acres was approaching a distress rate of 40%, and less than four months later, that ratio has gone above 45%. 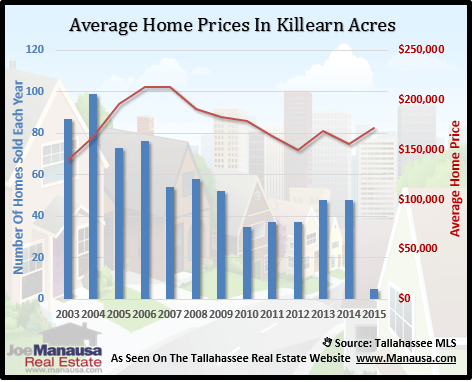 Nearly 1 in every 2 Killearn Acres home sales is a foreclosure, short sale, or bank owned property. Currently, there are 15 homes for sale in Killearn Acres. Recent sales prices have averaged just under $150,000, which is down from $164,000 in 2011. 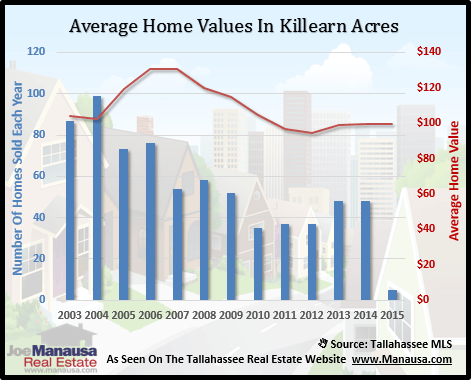 The value of a Killearn Acres home has dropped 28% since the peak of the market, when home sellers were getting $131 per square foot as compared with the $94 per square foot being realized today.